This friendly Celtic magic book is designed for both beginners and those who possess intermediate-level magical skills--and anyone who simply has a great interest in Celtic history, lore, and magic. Even as a young boy, I was interested in spirituality and its manifestations within religious structures. So it should come as no surprise that I was involved with the Wiccan movements in the United States. We published some of the first books on Wicca in the U.S. and held some of the first Pagan festivals in this country. Over the years I have received thousands of letters from people wanting to know how to become Witches. Many of them came from people who knew a little about the Craft and were specifically interested in Celtic Wicca. If you are interested in this style of the Craft and want to know where to start, I can recommend Celtic Magic by D. J. Conway. Over 225,000 people have this book, and you should have it, too. This book has everything you need to start learning the Celtic traditions. The tools, the rituals, the magical methods -- anything you would want is right here. Do you need a ritual for the Summer Solstice? It's in the book. Do you need some magic to gain love or money? You'll find it here, too. 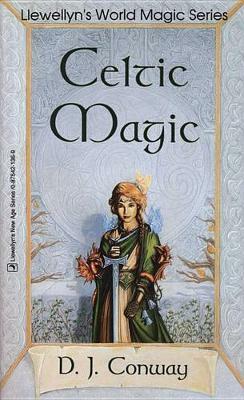 Celtic Magic is a great place to start your studies of Wicca. Do you need to know how to make a magic circle? Instructions are in the book. Do you need a set of magical correspondences so you can determine the best goddess or god, color or incense to use for any magical purpose? You'll find it here, too. Perhaps the best thing about this book is that it is clear and easy to understand. You'll not only read this book for the information, but because it is fun and holds your interest. This is a book you'll find yourself carrying around and frequently consulting. In fact you may find this to be the most valuable book you own.